Dry gin with a twist. It is rare when we can say a business is more than 300 years old. In 1693, Hendrick Steeman was granted a license to erect two Brandy stills in the Netherlands. This is the same business that we now call Wenneker Distilleries. Sure, it has changed ownership a few times, but Wenneker is still family owned and operated by the Van der Tuijn family who purchased it in 1903. Today, they have expanded the product line to include forty different specialty liqueurs and six spirits. Elderflowers have made a huge splash in the liquor world over the last few years. Elderflowers bring a fresh, pear-like flavour profile, with a hint of tangy citrus somewhere between a Meyer lemon and a ruby-red grapefruit. It is very refreshing and pleasant. 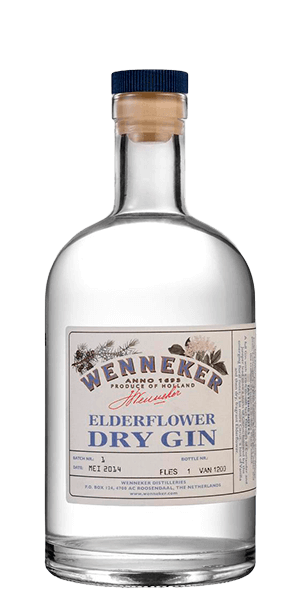 First and foremost, Wenneker Elderflower Dry Gin is, indeed, a dry Gin. So you get those juniper berries, but you get plenty of elderflower and other spices too. Wenneker stands on its own, but shines in a straight-forward G&T and a classic martini where its fragrance and texture will shine through. Again, delicate and clean are the order of the day, so we do not recommend that you waste it in a bath of onion or olive juice. It is especially good in a Vesper Martini, the James Bond classic where it dances gently with the potato Vodka, Lillet Blanc, and spiral of lemon peel … perfection. What does Wenneker Elderflower Dry Gin taste like? The Flavor Spiral™ shows the most common flavors that you'll taste in Wenneker Elderflower Dry Gin and gives you a chance to have a taste of it before actually tasting it. No real taste was over powered by the alcohol flavor. Clear and floral. For beginners. Excellent gin. Delicate flavor as expected, the elderflower is a great light and fruity addition. Would pair well with citrus, especially lemon.